23/4- The investigation into the deaths of five Julianos soldiers in a small Monteddorian farming community has already borne fruit. A spokesperson for Julianos issued a statement today about the suspected assassin. “We believe we are looking for a woman named Dougherty,” the spokesperson said. “She is the daughter of a Monteddorian woman and a Crowndonian expatriate named Alexander Dougherty, a deserter of the Air Corps who left the northern empire after the Minor Disagreement thirty five years ago. “She is dark of hair, in her late twenties/early thirties, and said to favor her Monteddorian mother, which will allow her to blend in with the populace, except for a mess of scars and tattoos on her arms. It is reported that she keeps these covered with long sleeves. 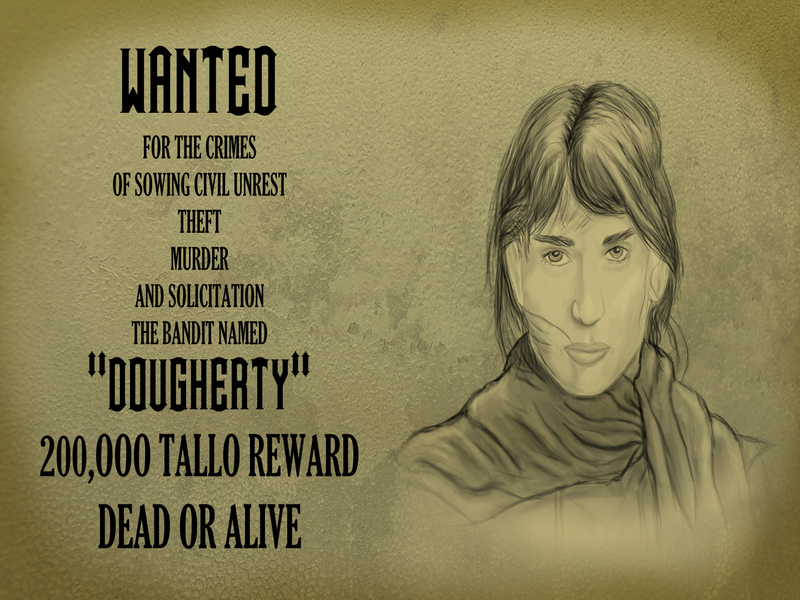 Julianos has issued a 200,000 tallo (roughly 20,000 gold pieces) bounty for Dougherty, dead or alive, and a 50,000 tallo reward for information leading to her capture or death. The statement also states that Dougherty is travelling with a platoon strength force of supporters. That force is slowly growing larger, as Dougherty is actively recruiting. “We stress caution when trying to deal with Dougherty,” the spokesperson said. “Though most of the people supporting her are merely farmers, the numbers and fervor with which they are said to defend her have already become storied in the region.